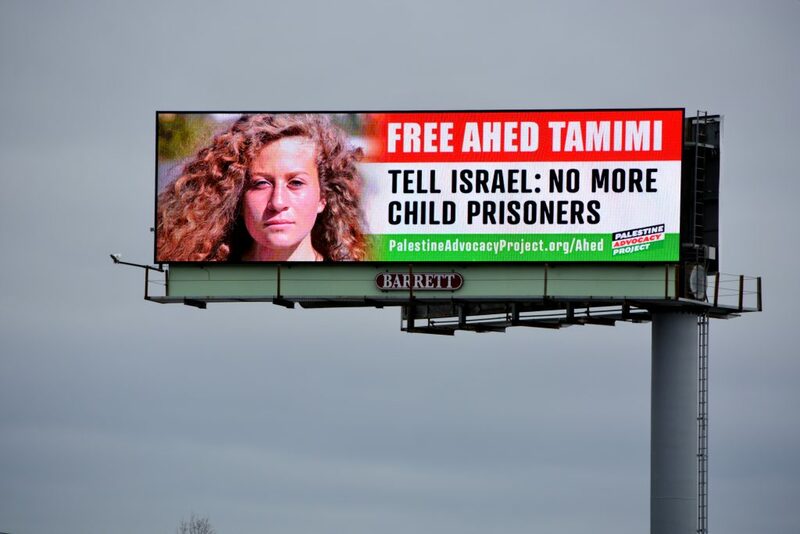 Palestine Advocacy Project put up two Billboards March 4th, 2018 to highlight arrest and imprisonment of Ahed Tamimi. Both billboard will be up for 4 weeks. On January 31st, Ahed Tamimi turned 17 in an Israeli military prison. She is from the West Bank village of Nabi Saleh and, beginning when she was 7 years old, has peacefully protested the seizure of her village land and water source by the nearby Israeli settlement of Halamish. 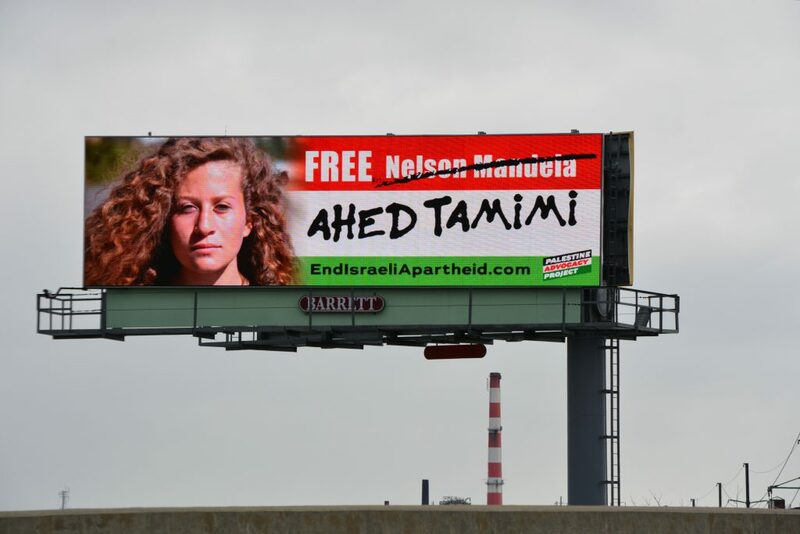 Like Nelson Mandela was for South Africa during that country’s apartheid regime, Ahed is a symbol of Palestinian courage and resistance in the face of the brutal 50-year occupation of Palestinian land and the apartheid regime of the Israeli government. 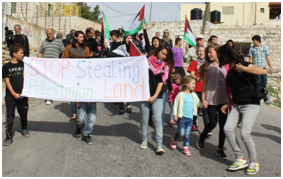 The village and the Tamimi family have paid a heavy price for standing up to the Israeli occupation army. Three hundred and fifty of the 600 people in the village have been injured protesting the land theft. The residents of Halamish, the Israeli settlement, have burned hundreds of the village’s olive trees — attacks that escalated after the protests began1. In 2012, Amnesty International labeled their father, Bassem Tamimi, a prisoner of conscience during one of his numerous stays in Israeli prison4 . Ahed’s family home has been raided more than 150 times by Israeli forces1. 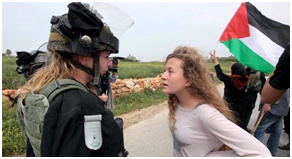 In 2015, when Ahed was 14, she rose to international prominence through the release of a video capturing her desperate attempts to save her injured 11-year-old brother, Mohammad, from the grips of an Israeli soldier. At yet another of those protests in December 2017, her 15-year-old cousin was shot in the face by an Israeli soldier. 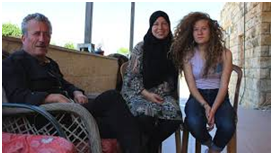 Minutes later, when soldiers invaded the property of the extended family, Ahed stood in their way. 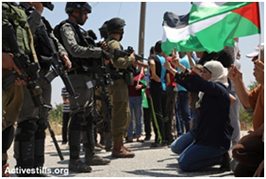 After they refused her request to leave, Ahed slapped one of the soldiers. Four days later, at 3AM, the Israeli military raided and ransacked Ahed’s home, arresting her along with her mother and cousin, and charging her with 12 criminal counts, including assault and incitement. She remains imprisoned. Her trial in an Israeli military court began on February 13, behind closed doors, the press excluded. These military courts have a 99.74% rate of conviction, and if convicted, she faces years in prison. Both Amnesty International and Human Rights Watch have called for her release. “Israel has the dubious distinction of being the only country in the world that systematically prosecutes an estimated 500 to 700 children each year in military courts lacking fundamental fair trial rights,” according to Defense for Children International-Palestine. 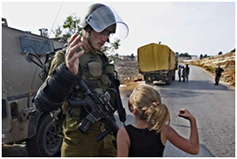 Children within the Israeli military system commonly report physical and verbal abuse from the moment of their arrest, and coercion and threats during interrogations. Ill-treatment in the Israeli military detention system remains “widespread, systematic, and institutionalized throughout the process,” according to the UN Children’s Fund (UNICEF). There are currently about 350 Palestinian children in Israeli jails. Nelson Mandela (1918-2013) was a leader of the struggle against apartheid in South Africa and the country’s first black head of state. He was imprisoned for 27 years by the white minority government for his anti-apartheid activism with the African National Congress. 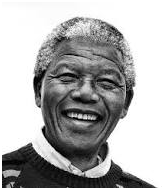 He gained his freedom in 1990 and was awarded the Nobel Peace Prize in 1993. In 1994 he became the elected president in South Africa’s first fully representative democratic election. Apartheid, a word coined in the language of the South African Afrikaner white minority, refers to the institutionalized racial segregation and discrimination practiced in that country under white minority rule. 4 Amnesty International. Israeli authorities must release Palestinian prisoner of conscience in West Bank.